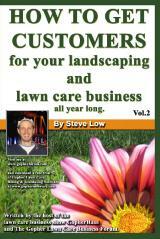 « How a lawn care business name can effect your future growth. We all get delusions of grandeur from time to time. Thinking we would be a lot better off if we could snap our fingers and grow our businesses 100% or 200% over night. Maybe if we bought out a company for whatever price, we’d make that money back and in multiples. The higher the cost, the more we believe this is a real option, a legitimate option. But that is where we are wrong most of the time. Let’s take a look at the reality of buying another lawn care company from this discussion on the Gopher Lawn Care Business Forum and see what we are really up against when considering such an option. One lawn care business owner wrote “I am in need of some help! Here is my situation. Right now I have 10 yards totaling $500 a week. All of these yards are mowed and serviced by myself with once a week help (roughly $80 payout). I get several upsells jobs through out the year such as mulch, flower, hedge trimming, etc. My question right now is, I have just started, gotten my sole proprietorship registered with the county but haven’t purchased insurance or any of my permits or licensing. I have been offered to purchase another mowing business for $10,000. With that business comes an additional 26 yards ($900 to $1,000 a week), trailer, ZTR mower, two line trimmers, leaf blower, and several misc tool. This business is about an hour from where I live, so roughly I can make two trips on one tank of gas. I have a friend who lives there that has another mowing business of his own, with that, he would give me his 8 yards($350 a week) if I employed him. So now I wonder with this acquisition what other operating costs would I have? Does anybody have a rough figure of want liability insurance is a month, permits, fuel for travel and mowers, workers compensation and if they thought this would be a good decision or should I just stick with what I have and try to expand in my hometown? Also are there any other costs that I might be forgetting or ones that I could do without? Do I need workers compensation or not? Are these operating costs accurate? Hire my friend as foremen of the one crew at $15 an hour. Add on one employee with him for $9. Have a helper with me at $10 an hour. 16 hours of work for a split of 22 yards per crew. Employee payroll of $544 = $1,306 a week. So what I am asking is, of that $1,306 what else should I take out: Maintenance price?, insurance? and what else? If anybody could provide me with some monthly break downs that would be great! 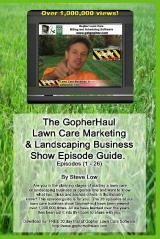 Should you buy this lawn care business? Right now, I pay $3,500 for the yards I have to currently service, which is 10. In the area I live, there are several other lawn care companies I am competing with and I have done some advertising but haven’t received any more customers. Competition is pretty heavy here. The company I am looking to buy has 26 customers, has the equipment, and the gentlemen is a good friend of the friend of mine. He is older and ready to get out of the business due to age (60 years old). His yards are over priced compared to mine, in my eyes. I price most of mine at $35 and he has several same size yards at $55. Plus there are several other yards in that area that are up for bid and other yards that my friend said another person is trying to get rid of. I am personally not into a lot of advertising, so this seems easier but I just don’t know! I would only be working my employees a total of 16 hours a week! One crew at $15 an hour ($240/week) and $9 (144). My crew would have myself and one other person at $10 an hour ($160)… bringing the employee payout to $1,306 left… So $1,306 times 4 weeks is $5,224 a month. Out of that I estimated $200 insurance, $600 fuel/maintenance, $800 a month for taxes, bringing my new total to $3,600 a month income for myself. $3,600 / 4 weeks = $900 divided by 16 hours equals $56 an hour or slightly less than that if you count hours for payroll and such! A second lawn care business owner said “the first big problem I see is that you are not even sure of your current operating expenses. You don’t have insurance yet, you aren’t licensed, you aren’t paying taxes. With all that said, why the heck would you want to increase the size of your business overnight by 200%! That’s insane! Windshield time is the silent killer. Ok beyond that. The jobs are an hour away! That is two hours of driving or 1/4 of an 8 hour work day! You don’t make money while you are driving to and from jobs. It’s called windshield time and it is a silent killer of mowing businesses. Next, out of those 26 customers, how many of them are on a lawn care contract? Even if they are, how many are you expecting to stay with you once you purchase the business? Have you broken down the equipment and priced them separately to find out how much it is worth? $10,000 is am awful lot of money to be spending on old equipment and questionable customers an hour away from you. Your overhead costs, which are different for everyone, need to include the costs of insurance, payroll expenses, self employment tax(about 15.3% from net income), license fees, gas, maintenance for all equipment, depreciation of equipment, advertising, administration expenses (time it takes you to do books)…etc. You need to get your current business going legit first before you even think about looking into buying another company. Don’t be a fool. I think that you can get way more than 26 customers locally with $10,000 to invest in marketing and slowly scaling up your infrastructure. This entry was posted on Tuesday, November 26th, 2013 at 5:59 pm	and is filed under Door hanger, Lawn Care Business, Lawn Care Customers, Lawn Care Employees, Marketing, Operational Costs, Overhead Costs, Residential Customers, Start up, buying customers, door to door, lawn care equipment. You can follow any responses to this entry through the RSS 2.0 feed. You can leave a response, or trackback from your own site.